Imagine the reactions of your fellow employees, clients and other relations if your employer makes a visible difference this year when sending out your season’s greetings card! 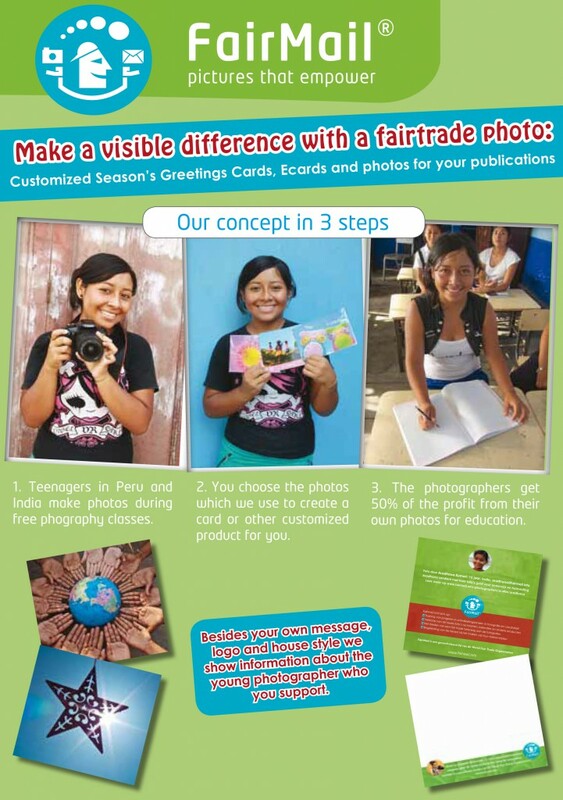 Whether as printed Christmas card, New Year’s E-card or tailor made fairtrade calendar, you can be sure to see a smile on the face of the receivers when they find out who took the beautiful photograph. And you can be sure to create a smile on the face of the FairMail teenager who can pay for his or her own education with the sale of their image to your employer. As you can read here FairMail is happy to work with you in co-creating any tailor made product, including your logo and personalized message. It is even possible to send a specific image request to our teenagers on a no-cure-no-pay basis. Due to lower printing prices this year, we can offer you our tailor made products with a 25% to 75% discount compared to last year, depending on the size and quantity. So check out the attractive prices and read more here. As FairMail lacks the means to contact all the potential customers we would be very, very happy with any tips or suggestions you might have regarding who we can contact to present our unique offering. You can either pass on our digital flyer which you can download here or contact us directly with the name and contact details of the person we should contact.